The indoor singers perform while students from Carrillo K-5 Magnet School perform the 81st Annual Las Posadas procession. Right: Anthony Moreno, 11, the “knocker boy,” leads the way for the Las Posadas procession, which represents the story of Mary and Joseph as they traveled to Bethlehem in search of a place for Mary to give birth to Jesus. The first few customers get stroll by getting a look at the decorations on the opening night of Reid Park Zoo Lights, Thursday, December 7, 2017, Tucson, Ariz. Zoo Lights runs through December 23, 6-8 p.m. Through December 19th there's $1 off admission if donating dog, cat, puppy and canned pate style kitten and dry foods, dog biscuits without dyes, plastic cat toys and Kong dog toys for the Humane Society of Southern Arizona; toys aged newborn to 13 years old, art supplies, games and books for Tucson's A List; peanut butter, cereal, granola bars, rice pasta, beans and canned tomato products, soups, vegetables and fruits for the Community Food Bank. Visitors admire the lights near Candy Cane Lane during opening night. 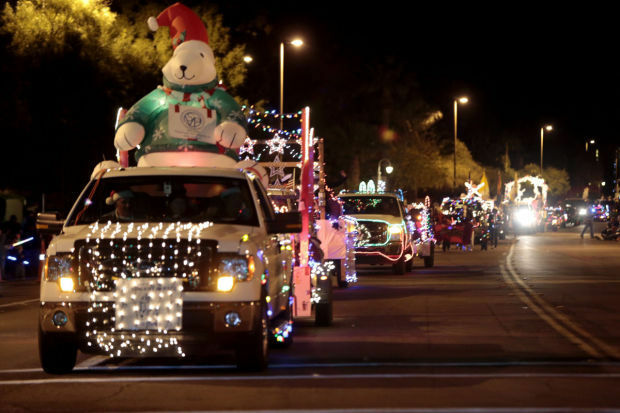 Tucsonans have been enjoying the Parade of Lights & Holiday Festival downtown since 1995. With lights in and on their costumes, Breisy Martinez swirls with the other dancers from Ballet Folklorico de Santa Maria as they warm up just before the start of the 20th Annual Downtown Parade of Lights. Maria Luisa Teña and the nativity scene she spent 30 years creating at Casa Cordova at the Tucson Museum of Art November 27, 2007. Beauty is all around us this time of year. From bright, festive lights to amazing displays and lovely processionals you'll want to make these Tucson events one of your family's holiday traditions. This beautiful festival put on by Carrillo Elementary students commemorates the journey Mary and Joseph made from Nazareth to Bethlehem in search of a place for Mary to give birth to Jesus. Dressed as angels, students carry the nacimiento through the streets of the Barrio Viejo neighborhood while singing songs they've rehearsed for weeks. Each child plays a role — dressed up as shepherds, peasants and angels. They carry candles, bells, a Christmas star, a poinsettia, shepherd's crooks and the nacimiento, or nativity. There's also a pinata, food and hot chocolate. Carrillo has been producing Las Posadas for 81 years. When: Friday, Dec. 14, 5-8 p.m.
Where: Carrillo K-5 Magnet School, 440 S. Main Ave.
Thousands of twinkle lights and displays turn the zoo into a magical wonderland. There's music, hot chocolate, Santa, snow, food and more. Each year people living in the Winterhaven neighborhood deck their houses out with amazing lights and elaborate holiday displays for all to enjoy. Make sure to wear comfy shoes and be prepared to walk. You'll end up parking in a nearby neighborhood and walking in. No driving allowed, except for Dec. 26. Go sledding downtown on 35 tons of fresh snow in Jacome Plaza. There will also be a family fair, live music and entertainment and local food vendors. The parade has been a Tucson tradition for 24 years and brings the community together to watch colorful floats, Baile Folkloriko dancers adorned with bright lights, marching mariachis and even puppies. When: Dec. 15, festival starts at 3 p.m. and the parade starts at 6:30 p.m.
Where: The festival is at Jacome Plaza, 101 N. Stone Ave. and the parade starts at the intersection of Church Avenue and Alameda Street. Find the route here. A magical, incredibly detailed 800-piece nativity scene is housed in the Tucson Museum of Art's historic La Casa Cordova. You'll see scenes from the story of Mary, Joseph and baby Jesus as well as other Bible stories. Maria Luisa Leon Teña created the exhibit that has been on display since 1978. Where: Tucson Museum of Art, 140 N. Main Ave. If your kid's room is so full of stuff it's starting to look like a toy store threw up in there, consider giving gifts that aren't things this year. Take the whole family on a hike while the weather is sweet. I think we can all agree it's pretty hectic out there right now.